As a certified personal trainer, I know how expensive 1 on 1 training can be. Therefore it only makes sense to search for more affordable options. This is probably why weight loss programs like Noom Coach are growing in popularity within the fitness industry. They provide a more affordable option for those struggling with weight loss. But the question many keep asking is…Is Noom Free? This is a great question because many weight loss programs like Noom provide users with an app in which you can manage your daily eating and exercise habits. So for some, it can be a bit confusing to know which options are free, and which options require a subscription. Below I plan on giving you a quick breakdown on how noom works, and how you can use their service for free. And if you’re interested in upgrading to their premium service, I will also breakdown what you should expect in terms of how they go about helping people lose weight with their diet plan. 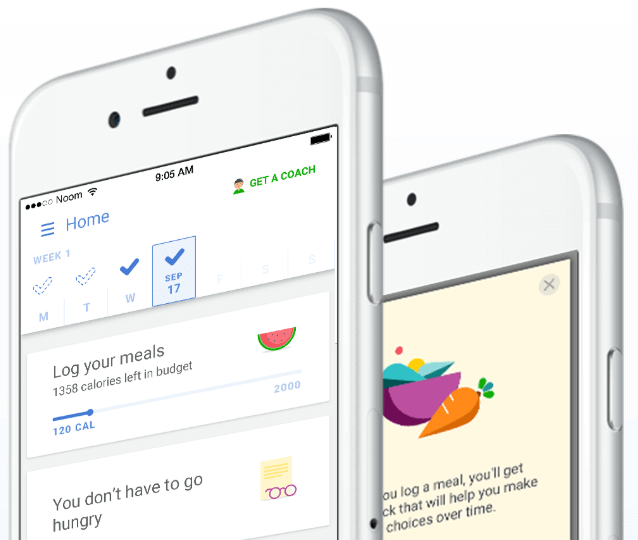 Noom is a weight loss programs that was created by a team of professionals that understand the struggles many face when it comes to losing weight. They understand that there are many factors that contribute to the lack of results many encounter when trying to lose weight. Factors like motivation, stress, lack of time, and of course lack of education. Also, i’m sure you’ve been told many times that in order to lose weight, all you have to do is eat right and exercise daily. But what many fail to understand is healthy eating and exericse is just the physical aspect of losing weight. There’s also a mental part to it as well. And this is where Noom steps in. They help their users manage not only the physical part of losing weight, but also the mental part by providing you with a coach to help keep you on track when times get difficult. The best part about this program is that you can do everything right from your phone. Since this is something we keep around us at all times, having access to this support is simple. So What Is Noom’s Pricing and Is There a Free Trial Period? Noom does have an app that you can download for free. This feature allows you to log your meals, exercise, and fitness goals which is crucial to your long term success. So if you’re looking for a way to do all this, there are many free apps along with noom that allow you to do all this. But if you’re someone who has struggled for a long time with weight and are looking for a way to finally create your success story, then it makes sense to become an actual member. I say this because this is where you get the full benefit of what noom has to offer. Noom offers three different plans that range from one month up to 4 months. If you’re looking to try it out for only 1 month, then it will cost you $59 for that one month of service. The 2 month plan will cost you $49.50/month and the 4 month plan which is the most popular plan, will cost you $32.50/month. Also the great thing about Noom is that you can cancel anytime. But for those that are worried about fully committing to the noom weight loss program, there is a 14 free trial for you to try out. So you will receive no charge as long as you cancel before your 14 days are up. If you decide to try the noom weight loss program during your trial period, you still get access to everything this program has to offer. There is pretty much zero restrictions allowing you to truly see if this program is something that will work for you long term. When you first create your account, you will be asked to answer a few questions about yourself. This is to help better understand your daily habits when creating a customized plan designed just for you. After answer the questionnaires, you will eventually be assigned a health coach, and be given access to support groups to help keep you motivated. One question I usually like to ask people when it comes to getting in shape is, what is your plan of action? What I mean by this is, what are the ways in which you plan on using to help get you the results you’re looking for. There are many other ways, but these tend to be the usual methods. Each way has there pros and cons and you need to make sure that whichever method you decide to choose, you are getting the best results based on the money your spending. So let’s quickly go over each way and break down the positive and negatives for each of them. Going To The Gym – this method is a very affordable option for those that are looking to save money. You get access to all the equipment you need, without having to worry about all the maintenance. On the other hand, for those struggling to get results at the gym, a big reason for that is that they have no idea what to do once there. There’s a reason why so many people have gym memberships but if you ask them when was the last time they went, you may find out that it’s been a while. Hire a Personal Trainer – with a personal trainer, you know that you’re getting expert advice when it comes to getting in the best shape. Not only do they show you the best exercise to perform, but also provide that therapy by being that ear for you when you need someone to talk to. Exercising at Home – performing your workouts at home can be a very comforting way to get in shape. No need to worry about other people occupying your machine which can be a pain when you’re just looking for a quick workout. But one issue with working out at home is finding motivation. It’s easy to get too comfortable and not feel any motivation when it comes to exercising. So after going through all those methods, noom pretty much provides an answer to each and every one of them. Not only that, but they do it at a very affordable cost. You’re getting that personal training experience and group support to help give you motivation for when you feel you’re lacking it. Also, you get access to all this from your very own phone. So it doesn’t matter where you are, you always have access. So is noom worth it? If you’ve had very little success with some of the methods I listed above, then it doesn’t hurt to maybe try out noom and see if it can be the solution to your problems. Also, the fact that there is a 14 day trial period, gives you a bit of time to see if it can be something that can work for you long term. So if you’re really interested in trying out Noom’s weight loss program, the first thing you will be asked to do is create an account. It involves answering some questions about your health so that a personalized plan can be created for you. So is noom free? If you’re just looking to use their app to help you track your meals and exercise, then yes it is. But if you need a bit more help, then you can become a premium member and get all the added benefits that come with it. As always, I would love to hear your thoughts and opinions. Have you ever tried the Noom Diet? If not, how do you think you would benefit from a weight loss program that focuses on not just the physical aspect of losing weight, but also the mental part as well? Hi! Please also note that with Noon you can cancel anytime but their policy is to provide NO REFUNDS so you should cancel only after you have used the months you paid for in advance as they also do not charge monthly. Great point Lela. If you’re not interested in continuing with the program, it’s important to make sure you let them know you’re cancelling before it auto renews. I signed up for Noom’s free trial and then canceled after I realized the coaching wasn’t really as helpful as I had hoped it would be. However, after requesting to cancel, Noom offered me a $20/ month membership so I’m going to give it another month and see how it goes. Sorry to hear that it hasn’t worked out for you, but excited to hear that Noom is making an effort to win you over by offering you a reduced membership fee. Hopefully all goes well with your experience, and you find some level of success with the program. All the best to you Mike! Hey Ralph. I came here originally looking for info on Nooms subscription fees, and now that I am aware, I just felt compelled to comment that I think this app would be more accessible (aka more afforbadle) for people of the company allowed subscribers to be billed monthly. I’ve read a few comments above regarding this exact topic…. and I have to agree, I can afford $32.50 a month, but I cannot afford $130 in one shot. That’s way too much to ask people to come up with for an app. Just trying to offer some helpful insight here. I really think you’d get a lot more business if this payment challenge was addressed. If Noom decides to bill monthly and not all on one go, I will sign up for a subscription. Until then, sadly I cannot. Hi Kay. I’m sorry to hear that you’re unable to afford the program as I think you would find much benefit with it. I think the reason Noom has it setup this way is because research has shown that people tend to stick with a program when a commitment is made. Because when it comes to losing weight, many people tend to give up when they don’t see results right away. So I hope you can find a way to become a member as I feel that you would like it very much. Thanks for commenting. I signed up yesterday for the free trial. During sign up it said something like you can sign up for a food plan for $59 so I figured that would be a weekly food plan. I was billed for it through paypal but I don’t see any option for doing that. Can you explain to me how that works. Hi Flo. You should be able to ask your coach within the app, and they should be able to direct you. Please let me know if you are still having trouble with it. Thanks. I received an email after giving my information to see if your program is for me or not. I was quoted the following; “120 lbs by July, $19.88/ month” in reaching my goal. Then further looking into the program I see the following cost of the program. I am confused. Is the above cost of $19.88 a month what I will pay or will it be one of the following costs? “2 month plan will cost you $49.50/month and the 4 month plan which is the most popular plan, will cost you $32.50/month”. Hi Margie, So the $19.88 per month you see is Noom’s 8 month program. They offer 6 programs all together. Keep in mind that noom does charge the membership all in one shot. I apologize for any confusion you may have had. I signed up for Noom on my PC. When asked for a mobile phone #, since I only have a basic TracFone & do NOT get service at my home, I entered the phone #, but will not be able to download the app. How & where can I download an app from my PC? If I can’t, cancel my subscription because it will not work where I live. Hi Brenda. Unfortunately you need to have a smart device in order for this program to work for you. Although I would recommend that you get a smart phone, But if that’s not possible, I would definitely cancel. Hope it all works out for you. Hello! Sorry to hear about your phone and happy belated birthday to you. Since everything is done using your phone, it will be somewhat difficult using the program. How long till you get a new phone? If for those 3 day you were enjoying the program, and you don’t think it will be too long before getting another phone, I would definitely consider continuing after your trial is up. Wish I could have been more helpful and again sorry for your troubles. Hope you enjoyed your birthday. My two week trial will end tomorrow and I want to know how to sign-up for the 4 month plan which is the most popular plan, that will cost me $32.50/month. Will this $32.50 be automatically taken out of my checking account each month as was the $1. that I paid for the trial plan? I can’t afford to pay for the whole 6 months at one time but I can afford a payment of $32.50 each of the 4 months. Also what happens if I need the program longer than the 4 months? According to the questions I answered in the beginning I was told it would take me almost 9 months to reach my goal. I really need to speak with someone who can answer these questions because the coach I was assigned said she could only answer issues cerning my health and knew nothing about the financial aspects of this program. I’d really like to speak to someone tomorrow if possible. Thank You in advance. Hi Rita, sorry for the late reply. I am not aware of any 6 month plans. Noom’s most popular plan is the 4 month plan in which you will be charged around $130 after your free trial is up which comes out to $32.50/month. If you need the program longer than the 4 months, your subscription will renew automatically for another 4 months. Whenever you are ready to cancel, just make sure to cancel before your subscription is up or it will renew again. I hope you were able to get started with the program. I am confident you will see great results. Thanks for commenting. Our company has the Walker Tracker app and we are able to participate in challenges as a company. Does Noom offer something that we can use to track our challenges as a workplace? Hi Barbara. Noom has a “My Group” feature that allows you to interact with other members in the group. So it can be a great way to hold each other accountable and motivate each other.